Celestial Reflections: Viking Sunstone Discovered? Add another reason to love crystals. Scientists now believe that simple calcite is the Viking Sunstone of legend. Ancient lore has suggested that the Vikings used special crystals to find their way under less-than-sunny skies. Though none of these so-called "sunstones" have ever been found at Viking archaeological sites, a crystal uncovered in a British shipwreck could help prove they did indeed exist. The crystal was found amongst the wreckage of the Alderney, an Elizabethan warship that sank near the Channel Islands in 1592. The stone was discovered less than 3 feet from a pair of navigation dividers, suggesting it may have been kept with the ship's other navigational tools, according to the research team headed by scientists at the University of Rennes in France. Because of the rhombohedral shape of calcite crystals, "they refract or polarize light in such a way to create a double image," Mike Harrison, coordinator of the Alderney Maritime Trust, told LiveScience. This means that if you were to look at someone's face through a clear chunk of Icelandic spar, you would see two faces. But if the crystal is held in just the right position, the double image becomes a single image and you know the crystal is pointing east-west, Harrison said. These refractive powers remain even in low light when it's foggy or cloudy or when twilight has come. 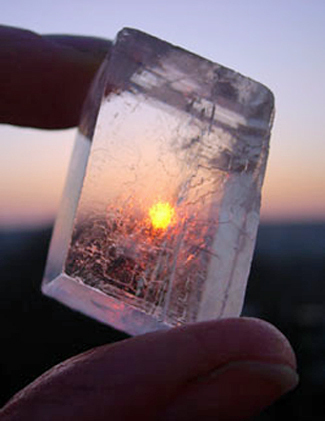 In a previous study, the researchers proved they could use Icelandic spar to orient themselves within a few degrees of the sun, even after the sun had dipped below the horizon.